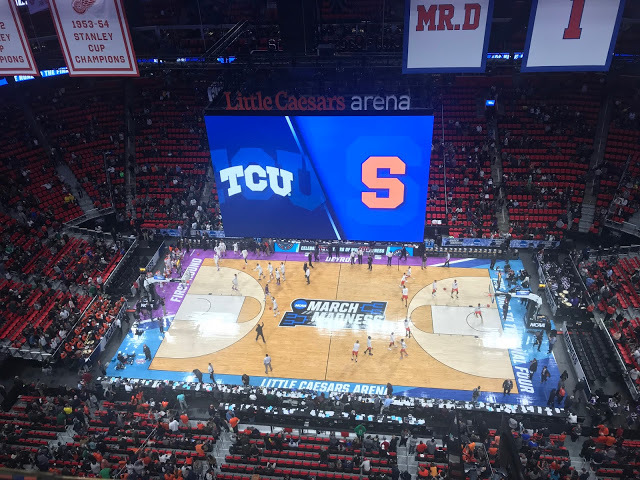 DAYTON, Ohio – Syracuse Orange overcame No. 6 seed TCU Horned Frogs in a 57-52 victory Friday night in Detroit to complete the First Round of the NCAA Tournament. All eyes were on the 6-9 freshman forward from Slovakia, Marek Dolezaj. Dolezaj dominated the first half of the game scoring the opening points for the Orange. Offensively and defensively, he showed up to play. With four early points for Syracuse, Dolezaj was active on both ends of the court. He ended the first half leading all scorers with 13 points and four rebounds. Despite fouling out with six minutes to go in the second half, he ended the night as the leading scorer with 17 points. Coach Boeheim made it clear from the beginning that it was going to be up to the Syracuse defense to win games. Tonight, that was proven. “It was our defense. Our defense was tremendous,” Boeheim said. Since the start of the NCAA Tournament, Syracuse has managed to hold two teams that score on average in the 80s, to a low 50 points. Syracuse out rebounded TCU, 37 to 34 and forced 13 turnovers for the Horned Frogs. During the first minutes of the game the ball got tossed around on offense quite a bit. From one half to the next, the offense seemed to slow down. The slow momentum and sudden change seemed to be an issue for the players. The Orange do well when adjusting to their opponents pace, but continue to play the game that they play. “Once we started moving the ball in the second half we started getting easy shots, easy buckets, cuts to the basket, stuff like that,” Battle said. With only 20 points in the paint, the slow scoring game wasn’t what the players wanted. “This team is going to fight, whatever situation we’re in, if the pace was a little different, we have to adjust,” junior guard Frank Howard said. Adjustments made all the difference for the Orange as they managed to squeak another tournament win over TCU. TCU’s head coach Jamie Dixon has a history with Coach Boeheim with a now 15-7 record coaching against him. Coach Dixon was the head coach at the University of Pittsburgh, that is where he gained the experience against Boeheim’s zone defense. Seeing as Boeheim said defense wins games, it was a true test for Dixon’s team. Overall, Boeheim and his players were still impressed by the match-up. Boeheim sees a difference in Dixon’s Horned Frogs team in comparison to his team at Pittsburgh. Dixon’s offense pushed Syracuse down to the wire as they kept it between a one and three point difference the last few minutes of the game. TCU’s Kenrich Williams led the Horned Frogs with 14 points and eight rebounds. Closely behind was TCUs Slovakian forward Vlad Brodziansky, with 13 points and three rebounds. Despite the strong offense, it just wasn’t enough to keep them fighting in the tournament. Syracuse will face No. 3 seed Michigan St. Sunday afternoon at 2:40 p.m. in the Second Round of the tournament in Little Caesar’s Arena.